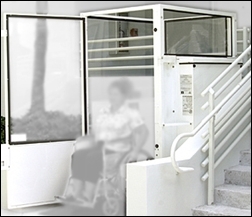 Wheelchair elevator lifts are specially adapted devices that are designed to elevate a wheelchair and its handicapped occupant up to the next level of a building, vehicle or any other kind of structure where elevation is required. There are a variety of wheel chair elevator lifts available for different environments including platform lifts, vehicle tail lifts and vertical elevator lifts. Wheelchair elevator lifts provide many benefits for the user. By using a wheel chair elevator lift the movement between levels is made easier for those in a wheelchair. It also prevents the need for transferring between chairs which can be an uncomfortable experience. This is different from stairlifts that requires the person to transfer from, their wheelchair or other mobility assistive devices, onto the stairlift chair. And because wheelchair elevator lifts allow the user to remain on their seats, they will not have to buy additional wheelchairs for each floor. Residential wheelchair elevator lifts allow the user full access to their house preventing restriction to upper floors which can sometimes happen. Wheelchair elevator lifts can either work off electric cabling systems or a hydraulic design. Whichever design is chosen for your wheelchair lift, it should incorporate a battery backup system so that the lift will still operate even if there is an interruption in power. Platform lifts differ from vertical elevator lifts because they are not an enclosed structure. The platform lifts are typically installed to get over stairs, curbs or areas not more than one level. The handicapped wheelchair individual rolls onto the center of the device and the edge of the platform raises up slightly to form a barrier to prevent the wheelchair from rolling out while the lift is operating. Handicap van lifts are also a form of an elevator lift but they are installed on vehicles. They raise the wheelchair/scooter user from the ground and allows for them to roll right into the transportation van. Vehicle tail lifts also help raise wheelchairs and scooters into vans and minivans. Instead of an elevator, it acts like a crane that lifts the wheelchair/scooter up and allows you to swing the heavy object into the vehicle. Installing the elevator lifts all depends on the environment. If it is a residential lift for example, then it would need to be installed at foot of the stairway. The length of time it takes to install would also very much depend on the property, some only take a day to install however some commercial wheelchair lifts may take a few days to install. Whether it is a residential wheelchair elevator lift, handicap van lift, platform lift or a commercial lift, it is always recommended to employ a professional to install it. 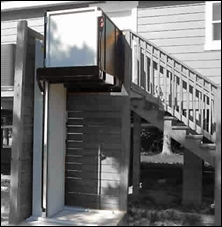 Wheelchair elevator lifts vary in price but residential ones can start as low as $1000, however, some of the commercial property lifts can cost several thousands of dollars. Some insurance plans will cover part of the costs of the wheelchair elevator lift. It is worth researching health insurance plans before purchasing a wheelchair elevator lift to see if insurance will pay for handicap equipment and cover any costs incurred. The wheelchair lift is classed as durable medical equipment and is usually only partially covered. In most cases, it will be the actual lift mechanism itself that is covered. The cost of this mechanism will usually amount to about $300 – $400. Although the cost of a wheelchair elevator lift can be quite high, they are a necessary and worthwhile investment.